114 backers pledged $3,417 to help bring this project to life. A RAY ARRAY is a new video directed by Sarah Rara that examines visual and aural interference. Structured like a collection of short stories, the piece is composed of 15 video chapters that deal with different forms of interference: from the failure of a message to be discernable, sudden interruptions, visual disturbance, the interaction of 2 sound signals, instability, and optical effects. The piece explores the subject of interference using simple sets, everyday objects, and subtle special effects. A RAY ARRAY will be exhibited as an hour long loop that the viewer may enter at any point. A RAY ARRAY features a soundtrack created by Luke Fischbeck and Sarah Rara, members of the band Lucky Dragons. The installation of A RAY ARRAY includes a set of wooden bleachers that occupy the space of the gallery, co-designed by Sarah Rara and fellow LA-based artists Michael Parker and Aaron Freeman. Come out for the first showing of A RAY ARRAY! Many people are donating their valuable time, talents, and insight to help make this project happen. I am extremely grateful to be working with such great artists and thankful for the generous support of A RAY ARRAY. Sarah Rara is an LA-based artist and musician who has presented performances and video installations at museums and galleries internationally, and is a member of the band Lucky Dragons. She has created performances and video installations in a wide variety of contexts--including MOCA Los Angeles, The Smell, Smithsonian's Hirshorn Museum and Sculpture Garden, Fellows of Contemporary Art, the Museum of Public Fiction, the Walker Art Center in Minneapolis, the Hammer Museum, the New York Art Book Fair, and Family among many others. Rara is currently working to complete her MFA at the University of Southern California. 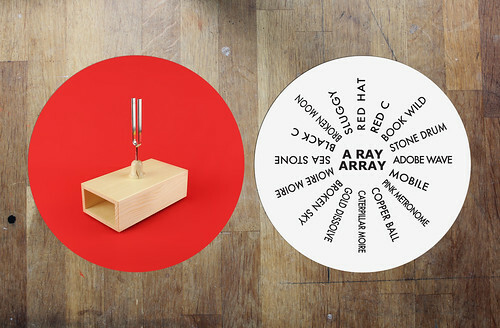 + limited edition A RAY ARRAY Circle Print, produced as a program for the exhibition. Black and white, 8.5" in diameter, offest print. Limited to 200 copies. donate $100 or more and I will write you a long letter this summer and mail it from somewhere special. this letter will be an amazing mystery unfolding just for you. original drawing by Sarah Rara, ink on paper, from the group of working drawings made in preparation to shoot A RAY ARRAY. Collector will select from the group of available drawings in June. a private (or public!) Lucky Dragons performance at your house, school, or event. Los Angeles area only. A great way to bring Lucky Dragons to your community, school, or venue and support this project at the same time! Subject to LDs availability, dates should be flexible.